Diabetes continues to be an ever-present threat to the health of Americans and Canadians alike. This disease is still on the rise, affecting the lives of a growing number of people, many of whom are now in their senior years. Yet diabetes is preventable. For those invested in reducing their risk factors for diabetes (and that should be everyone), here’s one simple strategy you can adopt: go for a 15-minute walk after eating a meal. Yes—it’s that simple! It’s already common knowledge that getting some exercise and eating a healthy diet that keeps your weight in check are two of the best ways to combat diabetes. But this new advice narrows the task of preventing diabetes to a very specific time of day. 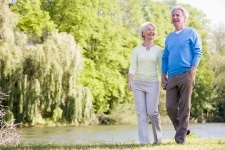 According to researchers, walking right after a meal could help stabilize blood glucose levels. When these levels fluctuate up and down and blood glucose swings from too much to too little, your body can start to suffer. Not only will diabetes set in, but the risk for heart disease goes up enormously too. The way to keep this system in balance is to keep blood glucose readings steady, and walking after a meal does exactly that. Researchers discovered this benefit when they found that many people at risk for type 2 diabetes were unable to keep up with the recommendation to get 45 minutes of exercise every day. For those with the symptoms of insulin resistance and who are overweight, sustaining a 45 minute work-out every day can be a challenge. This prompted the researchers to divide the 45 minutes up into three 15 minute segments. In this study, 10 volunteers, aged 60 and older, were recruited. All the participants were in good health—however, they were also at high risk for type 2 diabetes. The participants were each asked to perform three different exercise regimens on the treadmill. The first included 45 minutes of sustained walking at 10:30 in the morning. The second exercise protocol involved 45 minutes of sustained walking at 4:30 in the afternoon. And finally, the third exercise program had the seniors walking 15 minutes, three times a day after each meal. Why did the researchers focus on seniors in particular? When we age, our muscles become more and more resistant to insulin. At the same time, the pancreas becomes less efficient at producing insulin. This combined effect is at its greatest in late afternoon when insulin levels are at an all-time low. Now, go on to eat dinner and you have a situation where your body’s insulin can’t process any of the glucose you just ingested and you go to bed with high levels of glucose in your blood. How did the senior volunteers fair during the exercise tests? The three short walks were just as effective for lowering blood sugar levels. The researchers also found that the 15 minute walks excelled at preventing high blood sugar levels at bed time. This is a trick you can easily try yourself to keep your blood sugar levels balanced. Nakhla, M., et al, “Monogenic and other unusual causes of diabetes mellitus,” Pediatr Clin North Am. December 2005; 52(6): 1637-50. Taylor, P., “Brisk walk after meal may help prevent diabetes,” The Globe and Mail web site, June 13, 2013; www.theglobeandmail.com, last accessed July 3, 2013.